Terrain Predominately desert, with small mountains and lush forest on the northern borders. One of the oldest provinces in the world of Muelsfell, Askari boasts renowned merchants and a healthy economy. While the southern reaches of both Kern and Askari are coastal, only Askari's southern shores on the Bay of Chirens provide a reasonable safe port for trade with the rest of the world. This favourable location has served the province well and is directly responsible for making rich men of its rulers. This wealth has in the past proven to be too tempting a target to Dimitra. The most recent campaign began during the spring of 1603 and lasted until the winter of 1605 as Dimitra waged a mostly unsuccessful war against Askari in an effort to increase its borders. 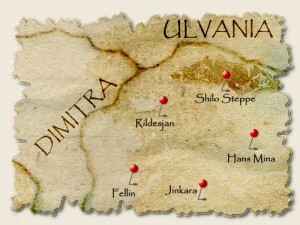 Dimitra managed to take the town of Shuul and its surrounding areas, but took so many casualities that they would never have been able to retain it had diplomats from Ulvania not stepped in to negotiate an end to the war. While Dimitra kept Shuul and a stretch of land reaching almost all the way to the Southmount, the trade off involved staggering economic repartations and concessions to Askari. Years have passed and those few who remember those times are approaching their final days, but bitterness still marks relations between the two provinces.